RCW 120 is a nebula that was first discovered in 1960 and is an H II emission nebula in the southern Milky Way, located 4,000 light-years from Earth. An H II region is a large, low-density cloud of partially ionized gas in which there has been recent star formation. RCW 120 is ionized by the O8V star CD-38 11636 and the B2 V star VDBH 84B. It is named after Alexander William Rodgers, Colin T. Campbell and John Bolton Whiteoak who cataloged the southern nebulae while working at the Mount Stromlo Observatory in Australia. The 870-microm submillimeter-wavelength data was taken with the LABOCA camera on the 12-m Atacama Pathfinder Experiment (APEX) telescope. 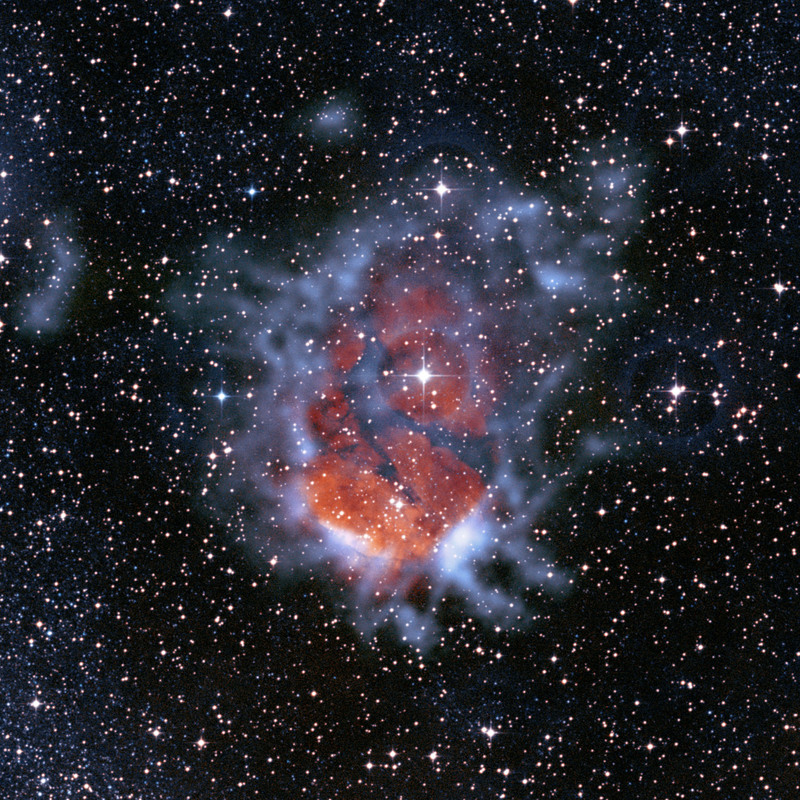 The submillimeter emission is shown as the blue clouds surrounding the reddish glow of ionized gas. This data was combined with data from the SuperCosmos H-alpha survey. This composite also has data from the Second Generation Digitized Sky Survey. This view (above) of the glowing emerald nebula, RCW 120, seen by NASA’s Spitzer Space Telescope is reminiscent of the glowing ring wielded by the superhero Green Lantern. In the comic books, the diminutive Guardians of the Planet “Oa” forged his power ring, but astronomers believe rings like this are actually sculpted by the powerful light of giant “O” stars. O stars are the most massive type of star known to exist. This region of hot gas and glowing dust can be found in the murky clouds encircled by the tail of the constellation Scorpius. The ring of dust is actually glowing in infrared colors that our eyes cannot see, but show up brightly when viewed by Spitzer’s infrared detectors. At the center of this ring are a couple of giant stars whose intense ultraviolet light has carved out the bubble, though they blend in with other stars when viewed in infrared. This bubble is far from unique. 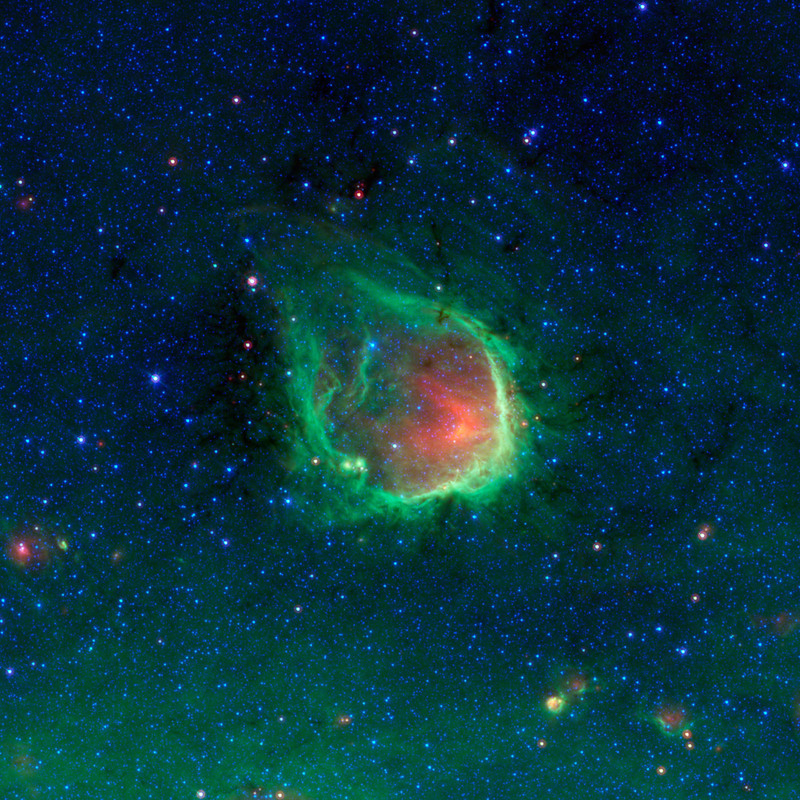 Just as the Guardians of “Oa” have selected many beings to serve as Green Lanterns and patrol different sectors of space, Spitzer has found that such bubbles are common and an can be found around O stars throughout our Milky Way galaxy. The small objects at the lower right area of the image may themselves be similar regions seen at much greater distances across the galaxy. Rings like this are so common in Spitzer’s observations that astronomers have even enlisted the help of the public to help them find and catalog them all. Anyone interested in joining the search as a citizen scientist can visit “The Milky Way Project,” part of the “Zooniverse” of public astronomy projects, at http://www.milkywayproject.org/. This is a three-color composite that shows infrared observations from two Spitzer instruments. 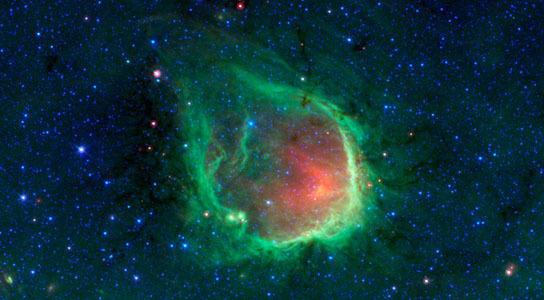 Blue represents 3.6-micron light and green shows light of 8 microns, both captured by Spitzer’s infrared array camera. Red is 24-micron light detected by Spitzer’s multiband imaging photometer. 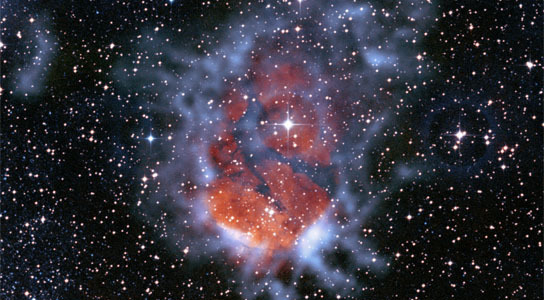 Be the first to comment on "Image of RCW 120 Nebula Shows Expanding Bubble of Ionized Gas"